1975 CHEVROLET CAPRICE IMPALA 20 p. BROCHURE 75 CHEVY CATALOG "Last Convertible"
NOS ORIGINAL SHOWROOM BROCHURE shows ALL 1975 BIG CHEVROLET MODELS -- CAPRICE, IMPALA, BELAIR, including the LAST BIG CHEVROLET CONVERTIBLE! Greencastle, PA 17225. 357 Blue Bird Trail. Paul Politis. 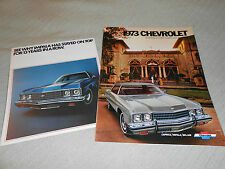 20-Page SHOWROOM BROCHURE details ALL 1973 BIG CHEVROLET MODELS -- BELAIR, IMPALA and CAPRICE. 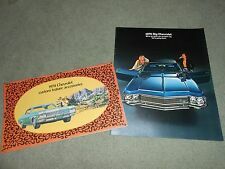 YOU GET BOTHNOS ORIGINAL BIG CHEVROLET BROCHURES for ONE LOW PRICE! Paul Politis. SERVING the COLLECTOR CAR HOBBY and MOTORING PUBLIC SINCE 1974. The 1961 Impala is arguably the best-looking full-size Chevrolet ever made. Great color images & tabs intact. Rare in this good of condition. With 57 year old fabric swatches! (Does not include any Corvette swatches.). 2004 CHEVROLET IMPALA AUTO SHOW/SHOWROOM SALES BROCHURE. Here we have a1971 Chevrolet Caprice sales brochure. This is an ORIGINAL brochure, not a reprint. Caprice in sedan---coupe. Bel Air sedan. This brochure covers the following models Features of this brochure. 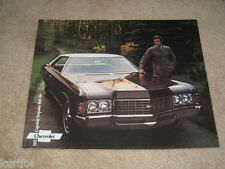 THIS IS A 1978 CHEVROLET CAPRICE CLASSIC IMPALA SALES BROCHURE.IN VERY GOOD CONDITION. 1971 Chevrolet Canadian Sales Brochure. The brochure has pictures/illustrations of the various models and information on features. Biscayne 4-Door Sedan. Caprice Coupe. Bel Air Sport Coupe. Impala Custom Coupe. Here’s a very rare opportunity for all 1994-95-96 Impala SS owners and fans of the Sports Sedan with a Corvette Attitude. Original 1959 Chevrolet Dealer Sales Brochure. Very informative Brochure, with many beautiful color pictures of the many Models that were available for 59. Includes Corvette, Impala, Bel Air, Biscayne, Parkwood, Kingswood. Bel Air---Biscayne both in sedan. Here we have a1968 Chevrolet Full Size Car sales brochure. This is an ORIGINAL brochure NOT a reprint. Caprice in coupe---sedan. Impala in Custom coupe---Sport sedan---Sport coupe---Convertible---SS Coupe---SS Convertible. USED 1967 CHEVROLET FINGER-TIP FACTS CATALOG. VERY NICE CLEAN MANUAL. THERE ARE BETWEEN 14 AND 31 PAGES PER MODEL. ORIGINAL CHEVROLET MANUAL. Here we have a2004 Chevrolet SS sales brochure. This is an ORIGINAL brochure NOT a reprint. This brochure covers the following models Features of this brochure ----Chevrolet's reference #. Cover all models of CAPRICE, IMPALA & BELAIR. 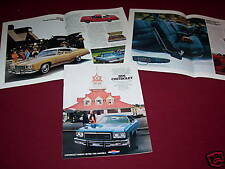 And you ALSO GET the RARER 20-Page FULL COLOR ACCESSORIES BROCHURE for the Big '70 Chevys, showing and detailing EVERY ACCESSORY AVAILABLE for the FULL-SIZE '70 CHEVROLETS. Here we have a1962 CHEVROLET IMPALA sales brochure. This is an ORIGINAL brochure, NOT a reprint. This brochure covers the following IMPALA models Features of this brochure Highlights many of the great Chevrolet features found in these vehicles. Bel Air---Biscayne both in sedan. Here we have a1966 Chevrolet Full Size Car sales brochure. This is an ORIGINAL brochure NOT a reprint. THIS IS THE LARGE DELUXE BROCHURE. This brochure covers the following models. Printed on two-sides of one-piece of paper. Very lightly scuffed, near very very good condition. 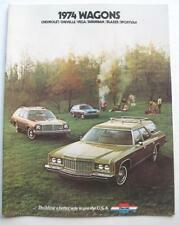 Here we have a1972 Chevrolet Caprice sales brochure. This is an ORIGINAL brochure NOT a reprint. Caprice----Impala----Bel Air in sedan/coupe/convertible. This brochure covers the following models Features of this brochure. Corvair Monza Spyder Convertible. Corvair Monza 4-door Sedan. Chevelle Malibu SS Coupe and Convertible. Sales Brochure. 20-page Brochure. Chevelle 300 - 2-door, 4-door, Wagon. Bel Air - 4-door, 2-door, wagon. This is a new 2017 Impala showroom sales brochure/catalog. It shows the interior, performance, specifications and exterior options in pictures and descriptions for the LS, LT, & Premier. If you own one, or would love to own one, this is a great addition to your paperwork for this car. Please ask if you have any questions. All items ship USPS with a tracking number emailed to you at time of postage purchase so you can follow your item to your door. Bel Air---Biscayne both in sedan/wagon. Here we have a1965 Chevrolet Full Size Car sales brochure. This is an ORIGINAL brochure NOT a reprint. THIS IS THE LARGE DELUXE BROCHURE. This brochure covers the following models. RARE ORIGINAL 1966 CHEVROLET IMPALA SUPER SPORT HARDTOP and CAPRICE CUSTOM COUPE Standard Size (approx. 357 Blue Bird Trail. Paul Politis. SERVING the COLLECTOR CAR HOBBY and MOTORING PUBLIC SINCE 1974. ). Wagons---Corvair---Corvette (just a picture, no info). Biscayne in sedan. Here we have a1960 Chevrolet Full Line sales brochure. This is an original brochure NOT a reprint. Interior pages are. Bel Air in sedan/coupe. Nicely illustrated throughout & covers the 1958 Bel Air Sport Sedan; Biscayne 4-Door Sedan; Nomad Station Wagon; Bel Air Impala Convertible; Bel Air 2-Door Sedan; Bel Air Impala Sport Coupe & Delray 2-Door Coupe car models. USED 1963 CHEVROLET ENGINEERING FEATURES MANUAL. THERE IS AT SEEM TORN COLORED PLASTIC AT TOP AND BOTTOM, BOTTOM HAS A PIECE MISSING. NICE CLEAN MANUAL. This is an original brochure with color pictures of all the models. Two-sided printing on one sheet of paper with one center fold. Very good condition. Form WRV 12-73. 1972 Chevrolet Impala/Caprice/Bel Air Sales Brochure Booklet ~ Chevy. This brochure is in fine condition for its age, minor cover shelf wear, internally fine. “The Sport. Sedan with a Corvette Attitude.”. The front side features a full color photo of a black SS. The back side shows a color interior photo and lists complete feature highlights. This is a mint, un-circulated original factory item. Original 1960 Chevrolet Dealer Brochure. This rare Dealer Brochure highlights the Solid and Two-Tone Color Options for Chevy Cars. It also includes Corvette Colors. It is in good condition with minor wear and soiling [see photos]. Like New Condition-Opened for the photos you see here. CD never played. From smoke free adult environment. FREE SHIPPING. 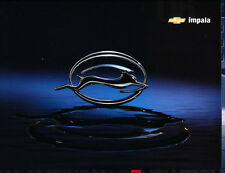 BROCHURE includes GREAT PICTURES and INFORMATION on the IMPALA and CAPRICE CLASSIC COUPES and SEDANS. Greencastle, PA 17225. Original 1960 Chevrolet Dealer Album. This Sales Reference Album is new in the original box. This well illustrated Album highlights the Features, Options and Specifications of the new Car Models. These include Impala, Bel Air, Biscayne, Nomad, Corvette and Corvair. 1966 Original, Chevrolet full size car, color, over-sized, sales brochure features Caprice, Impala, Impala Super Sport, Belair, Biscayne, and station wagons. Color chart on back cover. Read all about quality engineering highlights. Here we have a1994 Chevrolet Impala SS sales brochure. This is an ORIGINAL brochure NOT a reprint. 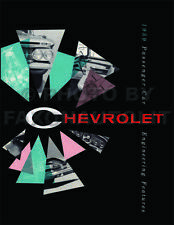 This brochure covers the following models Features of this brochure ---- highlights a few of the great Chevrolet features found in these cars. 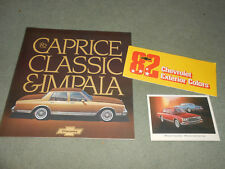 The brochure has pictures/illustrations of the Caprice & Impala and information on features. Caprice Classic 4-Door Sedan. Caprice Classic Wagon. Caprice Classic/Impala Facts -- Standard Features. Impala 4-Door Sedan. This is a reprint of the confidential manual written by Chevrolet Engineering staff to train salespeople on the features of the new models. This book describes mechanical and/or styling improvements of vehicles by explaining in detail how vehicles changed from the previous year. You will find detailed mechanical drawings, interior/exterior photos and dimensions, options/accessories, and lists of interior-exterior paint combos. Some of the information in this book can't be found anywhere else. 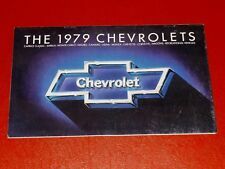 Buy now for this hard to find book..
1967 Chevrolet "Test-read a Chevrolet" Sales Brochure 70-PC-1. The front page has a nice picture of a Chevrolet. The models included in the brochure are the Details: W 10 xH 10 xD 0.1. Covers all models of IMPALA, BELAIR and BISCAYNE, including the SUPER SPORT! And you ALSO GET the RARE BROCHURE that CHEVROLET ISSUED to promote the new POWER STEERING available in BIG CHEVY MODELS and CHEVY II. SERVING the COLLECTOR CAR HOBBY and MOTORING PUBLIC SINCE 1974. Here we have a1970 Chevrolet Caprice sales brochure. This is an ORIGINAL brochure, NOT A REPRINT. Caprice coupe/sedan----Impala coupe/sedan/convertibe----Bel Air sedan. This brochure covers the following models. NOS ORIGINAL SHOWROOM BROCHURE shows ALL 1966 CHEVROLET MODELS: CORVETTE, CORVAIR, NOVA, CHEVELLE and BIG CHEVYS, including the popular SUPER SPORT option, Etc. Greencastle, PA 17225. 357 Blue Bird Trail. Corvair Monza. Corvair 700. Corvair 500. Corvair Station Wagon. 1962 Chevrolet Canadian Sales Folder. The brochure has pictures/illustrations of various models and information on features. New Chevy II.